Your vehicle monitors front seat belt use. If the power mode is set to ON before the driver's seat belt is fastened, a beeper will sound and the indicator will blink. 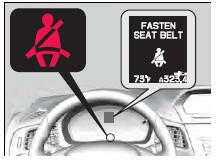 If the driver does not fasten the belt before the beeper stops, the indicator will remain on. The beeper will also periodically sound and the indicator will blink while driving until the driver's and front passenger’s seat belts are fastened. The indicator will also come on if a front passenger does not fasten their seat belt within 6 seconds after the power mode is set to ON. When no one is sitting in the front passenger's seat, or a child or small adult is riding there, the indicator will not come on. This is because the weight sensors in the seat cannot detect their presence.